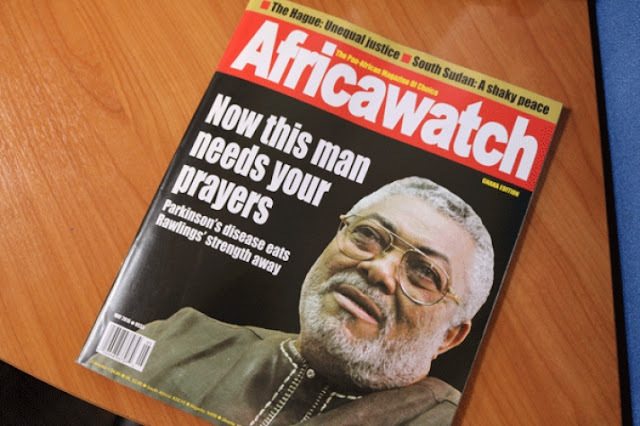 Former President J.J. Rawlings has described as blatant falsehood a report in the May edition of the Africawatch Magazine that he has been diagnosed with Parkinson’s disease. Lawyers for the former President have, therefore, asked publishers of the monthly magazine, Liberty Media Concepts, to retract the story, apologise with the same prominence given to the story or face legal action. A lawyer for the former President, Ms Hanifa Yahaya, told the Daily Graphic Tuesday that the publication was defamatory. “They are not speculating but were very categorical that they have spoken to his doctors in Ghana and in South Africa. “What motive will they have for such publication, if not defamation?” she said. The rejoinder said the story headlined – “Now This Man needs your prayers, Parkinson’s disease eats Rawlings’ strength away” was false and they (lawyers) had been instructed to take legal action against the magazine, if it failed to meet the demands of the rejoinder. “Take notice and notice is hereby given that if you fail to immediately retract the story and apologise for same, legal action shall be taken against you without any further notice to you,” it warned. Although the story claimed to have accounts from the former President’s doctors in Ghana and South Africa, it is scanty in detail and only gives details about the heydays of the former President and an elaborate detail on what the Parkinson’s disease is. Parkinson's disease is a progressive disorder of the nervous system that affects movement. It develops gradually, sometimes starting with a barely noticeable tremor in just one hand. But while a tremor may be the most well-known sign of Parkinson's disease, the disorder also commonly causes stiffness or slowing of movement. According to experts, in the early stages of Parkinson's disease, one’s face may show little or no expression, or one’s arms may not swing when you walk. One’s speech may become soft or slurred. Parkinson's disease symptoms worsen as your condition deteriorates over time. The Africawatch Magazine, distributed in nine countries, does not shy away from controversies. In 2010, it incurred the wrath of Parliament by announcing a survey that ranked the performance of Members of Parliament. “It is cast in bad taste and calculated to just sell a magazine that has very little credibility and thrives on sensationalism and not facts. “This is something that is medical and you will need to speak to him or to his doctor or some close family member to verify. You don’t just go out there and throw things like that. It is totally unethical,” he said. Describing the publication as intrusive, he said while the private lives of public figures were opened to scrutiny, it should not be about publishing concocted stories. “What is the essence of the story? If you read the story itself, there is no iota of evidence to prove what they are saying apart from a chunk of the story giving details of what the disease is which is irrelevant to the issue at hand,” he said. He also said it was impossible for doctors of former President Rawlings to throw their ethics into the gutters and tell lies about his health. “Everywhere in the world, doctors have doctor-patient confidentiality and regulatory mechanism to protect the privacy of their patients. “The magazine cannot come and throw dust in our eyes that for a personality of that level, his doctors are so reckless that they will be throwing around falsehood, “he said. Meanwhile, efforts to reach the Editor of the magazine, Mr Steve Mallory, did not yield any results as email to him had not been responded to at the time of going to press.